We are the leading manufacturer and supplier of Solar Home System, which are manufactured using very high quality raw material procured from the reliable vendors of the industry. This provides complete lighting and fans solution for the entire house at very affordable price. They are very Eco friendly and widely demanded these days. The product is delivered to the customers within the promised time frame. The product is available in varied sizes, designs and can also be customized according to the needs and demands of the customers. 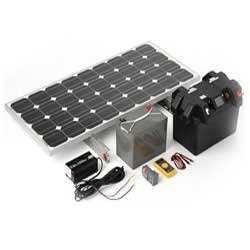 We are counted amongst the leading manufacturers and suppliers of this impeccable range of Solar Home System. For reasons of maintaining this reputation, making of this range is done as per the set industry norms and guidelines, utilizing the finest raw materials and modern machines. This ensures the product’s commendable capacity, unmatched strength, high precision, impeccable performance and longer service life.